The current wave of populism in the Western world is driving America and Europe in directions that are not only anti-establishment and anti-elite, not only anti-trade, anti-immigrant, and anti-global, but also anti-difference — in all its forms. Since at least the 1960s, the broad trajectory in the West has been to embrace and promote ever more difference in society, politics, and the economy; to view difference as an opportunity to be leveraged, not a threat to be defended against. Difference has been the ultimate win-win: So long as we exchange and share ideas, efforts, and products, everyone will be better off. The more difference, the better. Today, this win-win view of difference is increasingly under siege from a win-lose mentality. For me to win, you must lose. If you win, I lose. This mentality views difference as a threat, not an opportunity. And to “win” means pushing back against trade, immigration, multiculturalism, cosmopolitanism — all manifestations of difference. The rhetoric of Donald Trump exemplifies this perspective. Making America great again is all about winning. And winning means beating others, not looking for win-wins. Trump has taken the kill or be killed, sharp-elbowed world of New York real estate — where there are real winners and losers — and turned it into a political worldview: The way for America to be great again is to win again, to protect Americans from losing to migrants, foreign companies and foreign governments, or to people at home who look, act, and see the world differently. But most of life isn’t like a tennis match in which only one player can win and the other must lose. In fact, I believe essentially everything that is good in life is about win-wins — searching for them, working to realize them, and benefiting from them. And win-wins are all about leveraging the power of difference. The problem today is that many people are giving up on the notion of win-wins because they feel they are losing, that their lives are getting worse instead of better. They feel they are losing at the expense of the big winners — not only Wall Street, the City of London, and tech whiz kids from Silicon Valley to Tel Aviv, but also undocumented migrants from Mexico, refugees from Syria, and factory workers in China. Below is a stunning graph from a new book by Bridgewater Associates’ Ray Dalio, A Template for Understanding Big Debt Crises, that makes exactly this point. Inequality, or more precisely a breathtaking separation of the people at the very top of the income distribution from everybody else, is an increasingly dominant reality of our times. And there is a clear correlation between the emergence of the super rich and the rise of populism. The high point of populism today coincides with an income distribution in which the total wealth of the top 0.1% of Americans is almost as big as the total wealth of the bottom 90%. Inequality is a relative term. But it should not conceal that too many people are doing worse in absolute terms as well. McKinsey estimates that two-thirds of the population in the advanced economies experienced flat or falling incomes in the decade around the 2008 financial crisis. No wonder so many people are angry – at government, at big business, at foreigners and foreign countries. I think this is at the center of the rise of populism. And it amounts to a frontal attack on the pro-difference consensus that has dominated the Western world for 50 years or more. Here are two pieces of evidence of this frontal attack, concerning immigration and borders. The first is from a 24-country Ipsos survey, showing that roughly twice as many people are opposed to immigration as support it. This is remarkable given the vital roles of migrants woven into the cultural and historical fabric of the success stories of America and so many other Western countries, now dating back hundreds of years. The second piece of evidence concerns the hardening of borders, via a dramatic shot of the world from space using GIS technology in new work by my Penn colleague Beth Simmons. 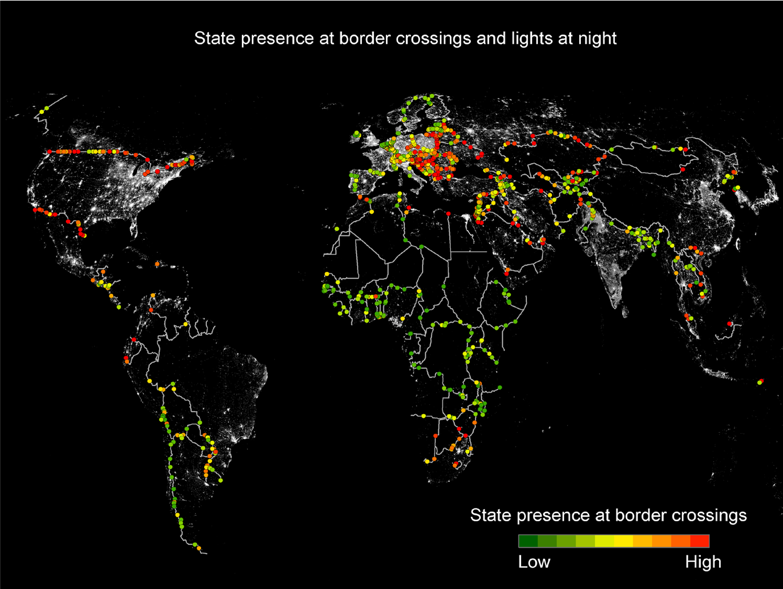 The map shows that despite all the talk about how technology and globalization have created an ever more “borderless” world, physical boundaries protecting and managing entry into the U.S. and in Western Europe of people and goods from often much poorer neighbors are a pervasive feature of the contemporary world. For those of us who believe difference is the ultimate win-win, what should we do? It is clearly not enough to assert that trade, immigration, and globalism are good for society as a whole. Rather we need to recognize and then address the root issues driving today’s populism, nativism, and nationalism. To do so requires not only real empathy with people who feel they are losing but also real solutions to the problems so many people face. Here is a simple three-part action plan for reversing the damaging trajectory that threatens much of what the West has stood for, not only since the 1960s but in fact since the golden age of political liberalism in the 19th century. First, we need to generate more economic growth. The 1990s was the decade when globalization and the internet really took off. But the push back against them was really quite muted. Why? One obvious reason is that economic growth was strong: 3.3% average growth in the U.S. GDP each year for the whole decade, 2.8% for all high-income countries. Second, we need growth to be more inclusive. Globalization and technology are key drivers of economic growth. But they have also been narrowing. Smaller and smaller portions of the population have contributed more and more to growth. We need to reverse that trend. Third, that means finding better jobs for more people. No surprise for someone in higher education, I believe increasing skills in society to take advantage of globalization and technology, rather than trying to protect against them, is the right way to go. And here a lot of the news is not nearly as dire as is often portrayed. Rather than a shortage of good jobs, we live in a world where not enough people have the skills needed to do the jobs of today. Techhire, for example, estimates there are more than half a million unfilled jobs in tech in America today. Karl Marx famously believed that our labor alienated us from who we are. For many today, what we do defines who we are. A lot of the disquiet in our world comes from deep dissatisfaction in the way the economy is affecting lives. If we can make the economy work better for more people, I believe we can get back to the place where we recognize difference is a source of strength in our society, not a threat to our well-being. And a place where we focus on win-wins instead of worrying about losing out to others. Research shows diversity can boost performance -- but it's equally important that everyone feels a sense of inclusion, belonging and respect, writes Wharton dean Geoffrey Garrett in this opinion piece. First, let me thank the author for a thoughtful, rather than combative, approach to bridging the gap between the two camps in the American political scene. I agree with much of what Mr. Garrett says. However, I would like to point out what appears to be misunderstandings in his analysis of the problems. The hardening of borders that Mr. Garrett refers to is of course not a consequence of legal immigration. It is solely a consequence of illegal immigration. Secondly, Mr. Garrett likely misleads readers in his discussion of incomes. Yes, incomes narrowly defined have been essentially unchanged for some time, but total compensation has risen. Specifically, employer-paid health insurance costs have risen dramatically over the periods in question. If not for this “transfer” of salary increases to increased health care premiums, the salary picture would be quite different. Thirdly, Mr. Garrett surely misleads his readers in the discussion of the distribution of wealth. Although he does not cite his source, his presented results suggest he is relying upon a popular, and very inaccurate, measure of wealth distribution. Specifically, the method in question focuses almost solely on financial assets (stocks and bonds) and ignores pension benefits (company sponsored as well as government sponsored) and, in many cases, home equity. Since pension contributions and home equity are the primary investment vehicles for the middle class, if one ignores such investments, any analysis will show (quite inaccurately) that only the rich have moved forward. I appreciate the opportunity to join in the discussion and look forward to any comments by the author or other readers.